the beginning of the 2014 Fears, Tears and Beers enduro. I first saw Ely, Nevada about ten years ago, driving back to the Bay Area after shooting the Red Bull Rampage freeride competition in Southern Utah. I wanted a more interesting and adventurous route than the standard I-15 through Vegas to Interstate 5 in California’s Central Valley. I definitely got what I was looking for on Highway 50, “The Loneliest Road in America.” While it’s not actually the loneliest road I’ve ever been on (that honor goes to Canada’s Highway 5 between Kamloops and Jasper National Park in Eastern British Columbia), Highway 50 is definitely bleak – especially the portion between Delta, Utah and Ely. After the unfenced, barren open range country to the east, Ely, populated by approximately 4500 hearty individuals, feels like an oasis of culture. The same is true if you drive from Salt Lake. The landscape on Highway 93, south of Wendover looks like a scene from the movie, Road Warrior. The high desert isn’t everyone’s cup of tea. I, however, am in love with the big, lonely vistas and small towns of Northern Nevada’s Basin and Range country. It’s a subtle landscape but if you open your eyes and heart, it will reward you. Ely’s been stuck in my mind since that drive ten-plus years ago and I’ve been looking for an excuse to make a return trip to get a more intimate look at the town and check out the mountain biking. This spring, thanks to the Fears, Tears and Beers mountain bike enduro race, I finally got my act together and made that trip. of Wendover and 90 miles northwest of Great Basin National Park. It’s about four-and-a-half hours by car from both Salt Lake and Las Vegas, and two-and-a-half-hour drive to Elko, the nearest “city” of any size. Why should you be interested in a dusty little mining town in the middle of nowhere, you ask? Because it’s a backcountry mountain biking paradise, that’s why. If you like your trails rough, raw and skinny, you need to put Ely on your mountain bike to-do list. Ely even hosts what may have been the first “enduro” mountain bike race in the world, the ultra-challenging, five-stage Fears, Tears & Beers. While no one is going to confuse Ely’s main street with Fifth Avenue, there’s definitely more to see than sage brush and cows. 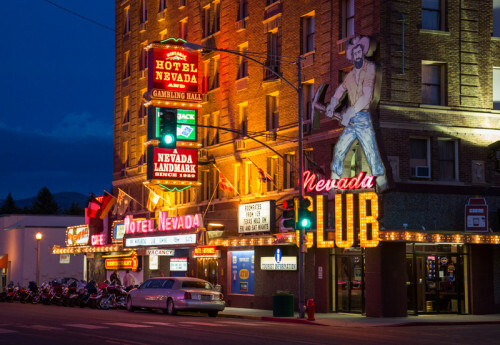 Two of the clear standouts are the Hotel Nevada and the Nevada Northern Railway Museum. The railroad museum is very cool, with a bunch of old trains, including the Ghost Train of Old Ely, a working steam train you can ride from the museum to the Robinson Mining District. With mining roots stretching back to the beginning of the 20th century, there are old mine tailings all over the mountains surrounding Ely. Copper is the primary mineral and there’s still a big, working copper mine just outside of town. The six-story Hotel Nevada was built in 1929, during Prohibition. It’s an important Nevada historic landmark and retained the status of tallest building in Nevada until the 1940’s. The Hotel Nevada is the only casino in Ely with live table gaming. It also has the town’s only 24-hour restaurant – I highly recommend it for breakfast. For a fun and tasty post-ride dinner, try the Cell Block Steakhouse in the Jail House Casino, directly across the street from the Hotel Nevada. All the booths are actual jail cells and I will personally vouch for the prime rib! The casinos actually played a major role in me finally heading back to Ely. No, it wasn’t the “loose slots.” I heard that the Fears, Tears and Beers race actually went through a casino and decided that was a photo I had to have in my portfolio. It turns out race participants actually roll through both the Jail House and Hotel Nevada casinos before heading up to Ward Mountain, just south of town, for the first timed stage of the race. 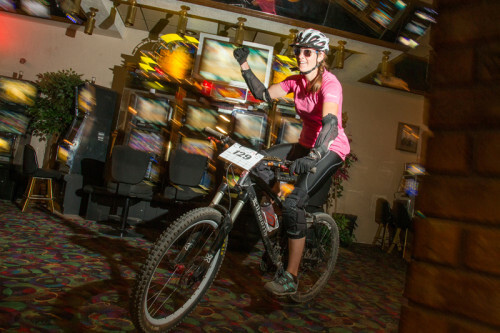 And yes, mountain bikers riding through a casino is a beautiful thing. Just peep this photo and you’ll see I speak the truth. just south of Ely, Nevada. 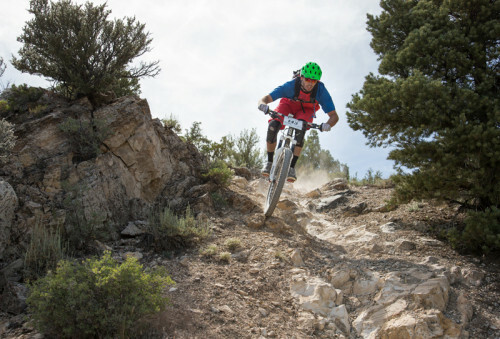 The mountain biking around Elko is excellent as long as you like your trails loose and rocky. I sampled the Whorehouse Hill downhill (so named because there are working brothels at the bottom of the trail) and some of the Ward Mountain trails. The downhill was no joke. It starts out with a lot of 6-inch-wide sidehill singletrack with some spicy rocky bits thrown in to wake you up. And then it gets really steep, loose and rocky. Check out my photo of Logan Whitehead sending it through a rocky chute in the final stage of the Fears, Tears and Beers race to see how burly the mountain biking can get in Ely. Whorehouse Hill is fun, with great views of the mountains and town. But it is serious downhill, best done shuttled in a four-wheel-drive truck and ridden on a full suspension bike with plenty of travel. I actually ended up walking a good portion of it and need to go back and to take care of some unfinished business. There’s something on Ward Mountain for almost any level of mountain biker and less adrenalin-fueled (suicidal) mountain bikers will find the Ward Mountain trails very enjoyable. They’re the cross-country counterpart to the technical downhill trails above Whorehouse Hill. The singletrack is still skinny and loose, though. Those are two qualities you can count on with all the trails around Ely. However, the grades are more manageable and the terrain is flowier without any real high-commitment rocky sections. There’s plenty of climbing to be had if you want it – you can ride jeep roads straight from town to Ward Mountain if you want to. But it’s also a quick drive south on Highway 6 to the Ward Mountain Campground and trailhead if you want to cut out the jeep road climbing. One of the things I like about Ely, and Nevada in general, is it seems like there’s nearly unlimited mountain bike potential. Local mountain bike guru and Fears, Tears and Beers promoter, Kent Robertson, tells me that they have everything from the high desert sagebrush trails I rode, to high alpine riding in the aspens. While I rode some great stuff in Ely, I know I haven’t even scratched the surface. A good example is Cave Lake State Park, a 30-plus acre reservoir located about 30 miles southeast of town, in the Schell Creek Range. I didn’t get a chance to check it out, but there are mountain bike-friendly trails in the park and I believe it’s even possible to do a mountain bike to the lake from town. If you’re into fat bike exploration, in January there’s a festival at Cave Lake with ice sculptures and fireworks. To get to Ely from Salt Lake City or Utah County, take I-80 100 miles west to Wendover and then head south on US 93 for about two hours. Make sure to fill up in Wendover because you won’t get another chance until you reach McGill, a few miles before Ely. You can also take Highway 6 west, from just south of Payson on I-15. Highway 6 merges with US 50 at Delta and then continues on to Ely. Gas up at Delta because you won’t see another gas station until Ely. From St. George, you either drive into Nevada and then take Highway 93 north to Ely; or you take I-15 to Beaver and then drive northwest on 21 until it intersects with US 50 and then continue west to Ely. As with the other routes, make sure you have plenty of gas because it’s empty, lonely country you’ll be driving through. Iceplant trails: Fun Loop. This is a 9-12 mile (depending on if you double back up and do The Whoops) XC loop on Ward Mountain with a fairly gradual climb that’s beginner friendly. The descent is fun, fast, bermed, buff, and twisty. It is quick and easy to access from town for a before or after work ride. Iceplant Trails: Full Coyote/Beginner Loop. This is a longer full-loop version of the Iceplant trail system about 14-16 miles long. The climb gets a bit steep towards the upper half beyond the cut off for the Fun Loop but is doable for strong Beginners and Intermediates. It’s mostly XC in nature with a few steep descents. If finishes off with Upper Slalom and Lower Slalom which is the lower section of Fun Loop. Ward Mountain Rec Area: G-loop to Town. This is one of my favorite go-to rides for taking visitors to sample some of the best of Ely riding. It’s a point to point shuttle that begins at Ward Mountain Recreation Area campground on Murray Summit, climbs approximately 1000 feet before dropping back down the Iceplant trail system to town on a fun fast 1500’ descent called Okee Dokie which has some optional drops, gaps, and wood features on the side. It’s about 12 miles and is recommended for intermediate to expert riders. Cave Lake: There’s about 20 miles of trail out at Cave Lake State Park 14 miles south of Ely. My favorite route is: Steptoe Creek to Cave Lake Overlook (CCW) to High Roller to Twisted Pine back to Steptoe Creek. It’s 10 miles with about 1800’ of IMBA grade climbing to the top of High Roller on smooth bench cut trail which can be a bit narrow at times and has 15 to 20 switchbacks most of which are fairly tight, so I recommend it for Intermediate to Expert riders. The descent off the top is some of the best, flowiest, four miles of trail you’ll find anywhere. Squaw Peak: Whorehouse Hill. 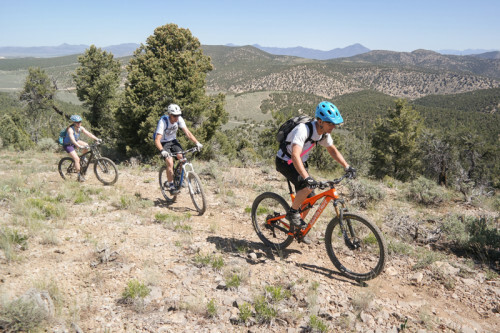 This is the expert loop for the Fears Tears and Beers Enduro and includes a soul crushing 4 mile climb up to the top of Squaw Peak on either a pretty well maintained, but steep service road or up a fairly loose washed out jeep road. The descent off the top of the peak from the cell towers is flowy but narrow at the top with some steep sidehill exposure and several fun looping but steep switchbacks. Then it traverses across a steep, rocky, narrow sidehill with a few technical sections down to the fast, wide open but steep, rocky, loose, final Whorehouse hill plunge—So named because it spits you out right behind the local brothels. It’s recommended for Expert riders and is about 10 miles long with about 1800’ of climbing and descent. Ward Mountain Rec Area 6 miles south west of Ely on US 6. Cave Lake State Park: 14 miles south of Ely. Turn off 7 miles south of Ely on US 93. John Shafer, a.k.a “Photo-John,” is a professional photographer, journalist, and adventurer. See more of his work at Photo-John.net.